Description: Hack Squats are a very quadricep dominant movement. They work on posture and help you increase the range of motion in your hips and knees. 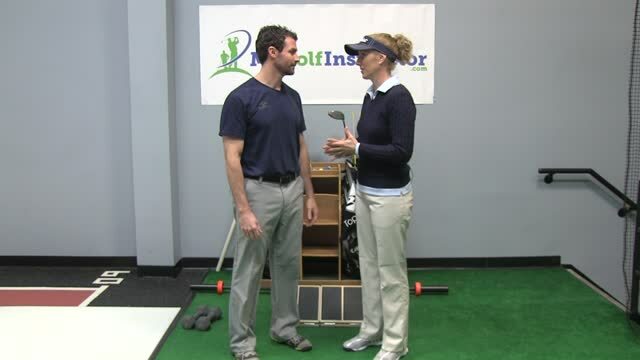 This helps improve posture during your golf swing while adding stability and range of motion to your pivot. They are particularly beneficial to those that have ankle restrictions. To start this exercise I suggest you begin with no weight until you find your balance and your form. You can simply use a PVC pipe, a broomstick or a light weight barbell. Stand straight with your feet slightly further apart than hip width. Elevate your heels on an incline. Be sure to keep your chest out and shoulders back. Hold the stick with a overhand grip behind your legs (right under your rear end). Next, bend your knees into a squat and allow your hips to go backwards. Keep your back straight and go down until your thighs are parallel to the ground if you can. The bar will now be behind your lower legs. Explode back up into your standing starting position and repeat. Go down slowly to the count of 3, pause and then come up quickly to the count of one. Begin with 3 sets of 8-10 reps and as you increase your strength week to week add weight.